Applicants must meet the University Campus Oldham’s minimum academic entry requirements for English language (normally demonstrated by GCSE grade C or equivalent). A minimum GCSE grade D in Mathematics (or equivalent) may also be required. Students will progress to the BSc Psychology after completing their foundation year, subject to meeting progression requirements. 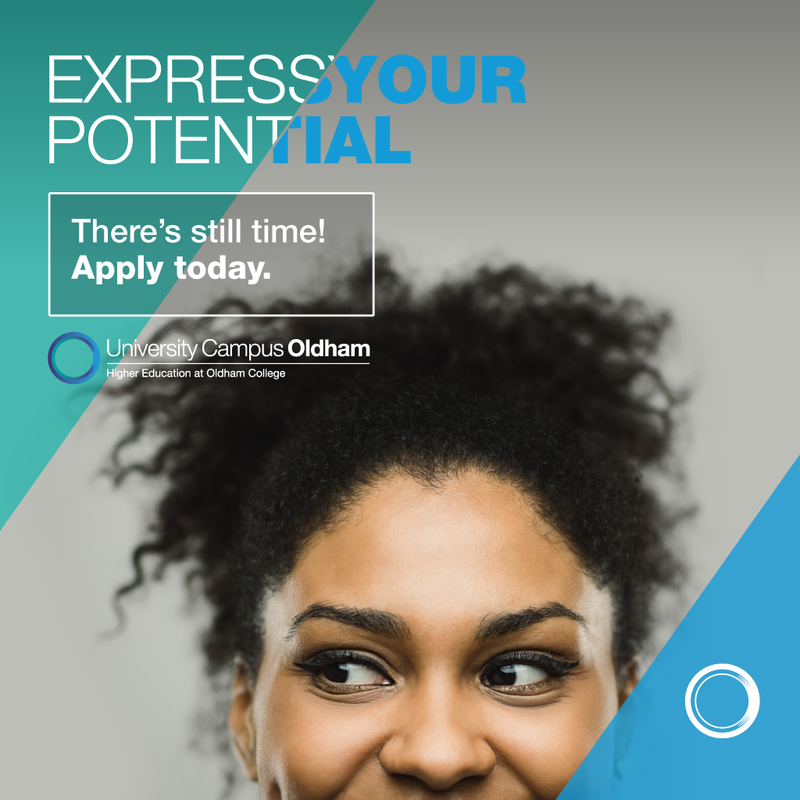 University Campus Oldham is committed to extending opportunities to all adults with the desire and ability to be a success. Therefore, our foundation programme does have a flexible approach to entry requirement. Younger applicants who have experienced issues of a personal, social or domestic nature, resulting in a disruption to their academic studies at a previous institute are particularly welcome, if you feel that you would benefit from the supportive environment on offer at a smaller University Campus. Studying for a degree later in life can be highly rewarding and lead to a successful career change. Mature applicants who do not hold any formal qualifications will be invited to an assessments interview and given an opportunity to demonstrate that they meet our minimum academic entry requirements and have the desire to complete the programme. In previous years, mature applicants at UCO have been some of our most successful students. We particularly welcome applications from mature students with non-standard qualifications. BSc (Hons) Psychology (after successful completion of the 4 year programme) validated by Sheffield Hallam University. The BSc (Hons) Psychology with Foundation Year at the University Campus Oldham is designed for applicants who are from a variety of vocational, academic and non-academic backgrounds. The overarching aim of the programme is to offer a range of stimulating learning opportunities to develop essential study skills and explore human psychology. The programme is carefully designed to provide a supportive environment that build’s confidence in the students’ academic abilities. The foundation year provides students with non-standard entry qualifications with a thorough and supportive academic preparation for successful degree level study. The foundation year will introduce students to a variety of proven learning and assessment methods that they will likely encounter in their degree. On successful completion of the foundation year, students will progress to the psychology degree delivered at the University Campus Oldham, where they will continue to receive tailored personal and academic support. Students will be introduced to traditional areas of human psychology such as cognitive psychology, biopsychology, and social and developmental psychology. The programme will be delivered in an active environment with an emphasis on practical experience, to support to learning of subject knowledge and academic skills. The foundation year will focus on core modules in Academic Literacy and Critical Thinking (20 credits), Essential Cognitive and Biological Psychology (20 credits), Exploring Psychology and IT (30 credits), Fundamental Social and Development Psychology (20 credits) and Introduction to Research Methods in Psychology (30 credits). Students will have opportunity to develop specific areas of interest through group work and discussion. As part of the core module in Academic Literacy and Critical Thinking, students will be provided with information about the benefits of gaining Graduate Basis for Chartered Membership of the BPS. A core aspect of the foundation year in psychology is the provision of the core module research methods and statistics. Teaching and practical activities within workshops aim to introduce students to fundamental topics in psychology. Students will have the opportunity to engage in practical workshops and make use of dedicated laboratory space. The foundation year will enable students to develop the knowledge, skills, abilities and necessary preparation to progress to our British Psychological Society (currently under application for accreditation) BSc (Hons) Psychology degree. Conferred eligibility for Graduate Basis for Chartered Membership by the British Psychological Society (BPS) is an important steppingstone towards becoming a professional or chartered psychologist, provided at least a 2:2 degree classification is obtained. Our BSc (Hons) Psychology degree will develop the knowledge, professional skills and abilities that are in demand from employers. The degree provides a platform for working as a counsellor or as a clinical, occupational, health or educational psychologist. Many of our graduates have used this degree as the foundation for further postgraduate opportunities. Employers value the psychological literacy and citizenship components of Psychology degree, such as understanding of human behaviour, effective communication, good skills in critical evaluation and research, analysing and presenting information. A degree from Psychology provides graduates with a range of professional and transferable skills that are valuable in many sectors such as public relations, personnel, advertising, marketing, retail, teaching, social work, finance, politics and sports. Local charities and voluntary agencies such as Anxiety UK, Langley House Trust, HC-one of a kind and Making Space. The foundation level will be taught within University Campus Oldham (UCO). Class sizes at UCO are kept small to enhance learning and tutorial support. It will take you one year to complete the foundation year and, if you successfully pass that, it will take you a further three years to complete your BSc (Hons) Psychology degree. Psychology is located in the University Campus Oldham building designed to house specialist teaching and research facilities. Resources include teaching, tutorial and laboratory space, specialist equipment supporting psychological research and psychological testing, software supporting data collection and analysis in psychology research, and other IT. As a student of UCO you will be able to access academic resources made available by Sheffield Hallam University.